This post is sponsored by PetSmart®, and the BlogPaws Professional Pet Blogger Network. I am being compensated for helping spread the word about Containment Products and Education for your pet, but Life with Dogs and Cats only shares information we feel is relevant to our readers. PetSmart is not responsible for the content of this article. When I was growing up, I didn’t know anyone who kept their dog in a crate. Back then I felt sorry for any dog who had to spend time in one. Don’t let Tucker’s sad puppy face fool you. He’s just waiting for me to give him the Release command to come out of his crate. He also gets a treat. The first dog I crate trained was Rosie, a terrier whom I took to agility classes to burn off some of her energy. She was a natural at agility, taking to the equipment like she had learned it in a previous life. The crate was where she waited in between runs. It was also where she stayed when we left her and Pasha — my Keeshond mix — alone, because Rosie’s response to separation anxiety was to destroy my house. Or at least gnaw on it. She’s the reason we had to remodel our laundry room; confined there, she tore up the floor. A command “Crate!” and a sweeping hand motion were all Rosie and Pasha needed, and they’d run — not walk — to their crates. They’d each get a frozen peanut-butter-filled Kong and would settle down to enjoy their treats and wait for us to come home. To me, crate training my dogs meant I didn’t have to worry about them destroying anything, getting into trouble or eating something they shouldn’t (like the linoleum in our laundry room). It also was an aid in housebreaking, as dogs confined to crates are very unlikely to make messes in them. When my dogs were puppies, they slept in crates in my bedroom at night. Puppy Tucker sleeping in his crate. What I didn’t realize at first was that a crate meant something different to my pups: a safe, secure place where they could rest undisturbed. I learned to leave the crates out with the doors open so they could go in whenever they wanted to. A crate is a nice place for Jasper and Tucker to curl up together. Rosie and Pasha are no longer with me. Now I have three different dogs, and four cats. And I continue to use the crates and a configurable pen for all of them. True, crates are good for all the reasons I mentioned above: safety, security, house training and potty training, but I’ve found many more uses for them. I believe every person who has a dog or a cat should have a crate or a travel carrier for their pets as standard equipment. Here are just a few of the ways I’ve used our crates and pens. Crates were used to help with potty training. At night, puppies who weren’t housebroken yet slept in crates. Tucker was crated at night in our bedroom, while Jasper and Lilah could sleep where they wanted, as they were completely potty trained. I used the crate as a barrier to confine all the dogs to one room when we left the house. Athena would amuse herself by walking on top of the crate. Tucker didn’t mind; it gave him something to look at. Doesn’t that hurt your paws, Athena? The dogs and cats sometimes shared the comfort and security of the crate. I think it created bonding moments. When the cats were young, I used the crate as a barrier between rooms. If the dogs got too rambunctious, the cats could run through the crates fast (notice the two open doors) but the dogs were slowed down. This gave the cats a feeling of security. Tucker’s ball is in the crate with Dawn. He knew better than to disturb her if he wanted to get it. He had to wait until she left — or use another ball. Calvin and Jasper meet nose to nose. …and to the other cats. Athena is curious about the kittens who can play safely in their pen, while she tries to figure them out. Cat kennels or carriers are also important, as they are the only safe way to transport a cat. I sometimes leave the carriers out for the cats to inspect, so they are not always associated with trips to the vet. When we helped rescue Slick a few years ago, the crate was his refuge, where he felt the most safe and comfortable, until we found him a home. Slick spent many hours holed up in his crate, and we left the door open for him to come and go as he needed. This is why, when BlogPaws and PetSmart asked me if I wanted to write about pets and crates, I said yes. During the month of March, PetSmart has crates, kennels, carriers and accessories on sale, where there are plenty of options to choose from, to fit your budget, home and pet. Jasper poses by just a few of the crates and crate pad options available at PetSmart — and on sale this month. Want to know more about crate training? You can crate train your dog at any time; you don’t have to start when he or she is a puppy. The same goes with cats. Unless there was some previous severe trauma in their past involving crates, kennels or carriers, any pet can learn to be comfortable — and actually come to love — their crates. 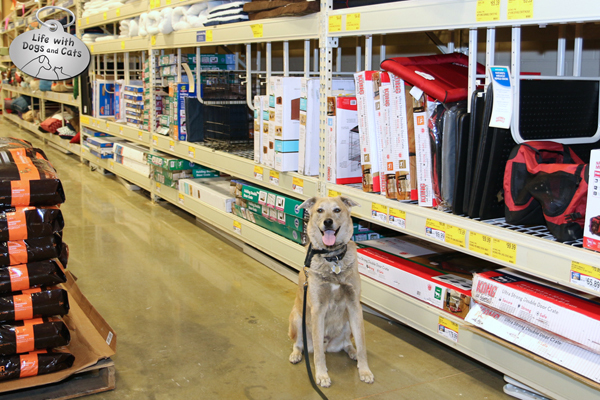 Find the right crate, kennel, carrier or accessory for you at PetSmart. On sale now through the end of the month. Learn how to crate train your dog. Get some tips on how to crate train your puppy. Learn about positive portable kennel training. Read a great overview about crates, gates, and kennels. Find out how to safely travel with your cat. Do you crate your pets? Why or why not? Tell me in the Comments section. Today, we’re participating in the Monday Mischief blog hop. Take some time and visit some of the blogs below. 46 Comments on "Crate Expectations: Why a Crate is Essential for Your Pet #CrateHappyPets"
Super duper important topic – and so many people get sidetracked by an emotional response. But think about it – just like humans ‘enjoy’ their homes, so does a dog lub der crate. Just making it a safe and enjoyable experience and not a place where ‘lock-ups’ occur and dey’ll get da hang of it, just like a den! You’re so right. We might not like being confined, but for a dog, it can mean a safe, secure place. I so wish my girl would crate… I’ve tried so many times but with her anxiety issues I’ve been told by professionals to just give it up. She panics and injures herself if left alone. She will crate at the vets and doggy daycare (where she can see other dogs right next to her) – she is not happy about it but does it. She will also crate with another dog – she just can’t be left alone. Separation anxiety is one of the hardest to deal with crating. I do agree it is a needed thing. Having shown dogs for over 15 years mine were all crate and table trained. This is a first for me and can be extremely hard on both of us (Dixie and her Mom). I’m sure you tried. I had a real hard time with Tucker at first. He would destroy everything inside the crate at first, and make a mess all over it. I had to really slow down to crate train him. It took a lot longer than the others, but it worked eventually, and you can tell from the photos that he learned to love it. I understand that some dogs just have a hard time with it — either due to a previous bad experience or simply from their anxiety. My Lilah was terrified of the way the bottom of the crate banged and clanged, which is why we used a configurable pen instead of a crate for her. Then she could be confined and there was no bottom to scare her. Wow, these pictures are fantastic! Great information, too. Thanks. I love the fact that even the cats liked to hang out in a crate. We actually never needed one. But our dogs’ lifestyle is different because I work at home. We’re big fans of crate training. It really comes in handy for puppies! Absolutely. A crated dog is a good dog. We have to remember not to think like a human, but think like a dog. And they really like the comfort and security of a confined space. You’ve found a lot of great uses for crates! Thank you for letting me know about the sale in March. I have been wanting to get Milita a new carrier, and that seems like the perfect time to do it. Now is definitely a good time. The sale goes on until the end of March. I couldn’t survive without a crate – they are too good for so many reasons! You said it. There are so many uses for them. I never really used a crate all the time until we had Jack. We used it to help calm his anxiety when we first got him…covered up it really helped soother him. Now, it’s just out in the sunroom with an open door. Jack usually goes and sleeps in it during the night and Maggie sleeps in it all the time too. Amazing how much calmer some dogs are when they know they have a safe “cave” as a refuge. That’s why I’m such a believer in crates. Our dogs aren’t crate trained. I see the use for it. It’s excellent. We just haven’t been in a situation where it would be beneficial. And I like having the dogs loose while I’m gone. They’re my home security system. I completely understand. My dogs aren’t crated anymore. They’re justs prevented from going into one area of the house (the laundry room) because one dog (Tucker) really likes Litter Box Treats. Crate training meant my dogs learned to love the crates, so if I ever needed to use them again, they wouldn’t be stressed. I would have retired our crates much earlier, but the dogs really liked them, as a place to feel safe. Kilo loves his crate, I think he believes it’s his own little house. Right. My dogs all did too! So many benefits to crate training! Our carriers get left out sometimes, and the kitties always have fun playing in them. It has helped to get them to be calmer on car trips in the carrier! Exactly. Crates and carriers aren’t just for trips to the vet! Thanks. I thought it illustrated how the dogs (and cats) used the crate: as a refuge. My dogs “graduated” from crates at different times, but I never gave our crates away. There are times when I’ve brought them out again: when a dog is sick, or when someone needed to be on enforced bed rest. Oscar is crate trained, and I’m so glad I did it. That’s where he sleeps until I get up in the morning, and I’m ensured a good night’s sleep – so I’m not a cranky dog mom in the morning! I agree, crates and carriers are great. They are comforting both for the owners and the pets. I love the safety that a carrier offers my cats while traveling. People are crazy on the road! Good point. They do comfort me as well. We are all crate trained but aside from Bailie none of us “love” to be in there, nor were we ever in the crates too much. It is just good to know we are alright with a crate when the need arises. That’s perfect. Even if you don’t use crates now, your pets are familiar enough that if they need to be in a crate, it won’t be too stressful. Mr. N has separation anxiety so he is not a huge fan of the crate. We have one that I keep open that he eats in. He doesn’t destroy things or eat weird things so he is trustworthy in the house. I do have a soft carrier for when he goes places and he tolerates that as long as I am with him. He figured out how to open it from inside the one time I left him alone in it for five minutes. That’s the thing about crates. You use it for Mr. N to eat in. That’s kind of my point. Even if you don’t use a crate to confine a pet, there are so many uses for one that they’re good to have around. As for opening up the soft carrier; that doesn’t surprise me. Mr. N is one smart cookie! The mom leaves our carrier out all the time so we aren’t scared of it. Occasionally, one of us will take a nap in it. Perfect. That’s just what I’m talking about. It’s a place where a cat can feel comfortable. Excellent post! I started crate training our pups as soon as they came to live with us at 8 weeks of age, and they also spent their first few weeks sleeping in them at night in our bedroom. A gradual, slow introduction is important to make sure the pups associate only positive things with the crate! I love the picture of your pup & kitty hanging out in the crate together ~ how awesome is that! Great advice on crate training – thanks for sharing! I love that you crate train your dogs AND cats! I do the same. I actually have crate trained my rabbit too. I compete in agility, so it is necessary for my sport, but it is also nice for safety, comfort, and relaxation. Great post!